These are not just words to us, but a lifestyle and dedication to support Dayton in every way. Crafting great beer is just one of those ways. 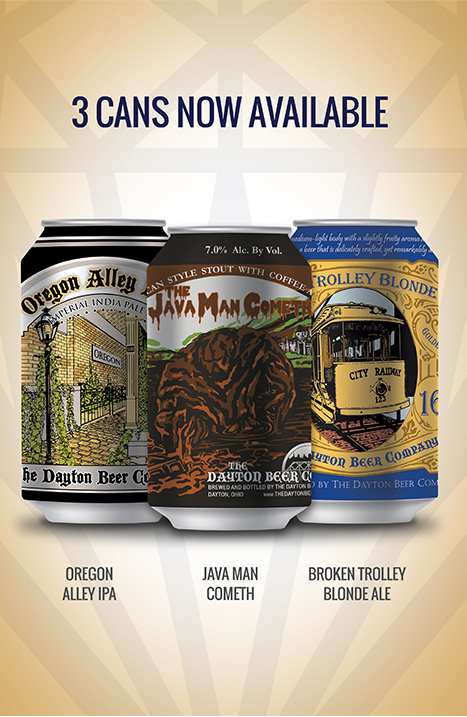 The Dayton Beer Company was founded by Owner and Brew Master Peter Hilgeman. Since 2012, when the doors opened to the Kettering Tap Room & Brewery, the first locally owned and operated brewery in Dayton in 50 years, we have grown from a one bbl Pilot Brewery to a 15BBL Production Brewery in less than three years. We don’t believe in shortcuts when we make our beer, which is evident as soon as you taste it. This commitment to quality ensures that our consumers enjoy the freshest and most flavorful handcrafted beers possible. Giving back to the community is essential to our core beliefs and we strive to better the city in any way we can. Through hard work and commitment to excellence,we have been fortunate in just three years of business to have won numerous awards and earned recognition both on the local and national level. As we continue to grow so will Dayton. We invite you to join us at our European style beer hall and production brewery, located in the heart of Downtown Dayton and just steps away from Fifth Third Field! We are proud to offer up 3 of our most popular beers in your local grocery store and carry out. Check your local fine beer shop for our delicious brews. We keep a number of our beers always available in our tap rooms. Stop on by and taste the flavors not yet on your local store’s shelf. Every month changes up our rotating cast of seasonally appropriate beers. Whether your braving Dayton’s brisk winters, or sweating through our humid summer, we’ve got a beer to satisfy. Here to day, gone tomorrow. We are constantly trying new things, many of which are quite tasty. We have an actively rotating cast of limited beers to tempt the adventurous.